How do you talk to a . . . . Imagine you are at a dinner party one night. The rest of the group fidgets awkwardly, but says nothing. Some would respond by vigorously defending Christianity. Instead of fidgeting awkwardly, this person would storm forth and, perhaps not so gently, seek to defend Christianity. But many of my readers would simply let that assertion pass and hope the dinner conversation would move on. Such a person is not spiritually thirsty and maybe they’d take a pass. Can you intelligently engage such a person in meaningful conversation without getting embarrassed or run out of the room? Greg Koukl’s book, Tactics, can help you in such a situation. I am always interested in books about evangelistic conversation skills. 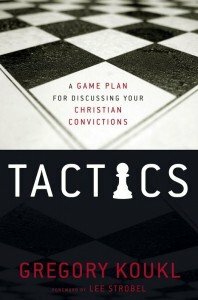 Greg Koukl’s book, Tactics lays out a great set of skills to use with people who object to your Christian beliefs. If you are regularly talking with people who are hostile to your faith, anchored in their own beliefs, or dismissing your beliefs through un-reasoned cliches, then this book can help you further the discussions in intelligent ways. Use questions to help people see the unreasonableness of their assertions. Questions opens the door to examine truth claims, and sometimes introduces doubt or produces changes. You said, “the essence of Jesus teaching is love.” Would you tell me more about your study of Jesus’ life and teaching? What specific things make religions similar? Don’t you think there are significant differences as well? Isn’t telling people to love one another just another example of telling them how they should live and believe? This book is not about how to share the gospel. There are other great books for that. Instead Greg Koukl’s book, Tactics, focuses on those conversations that occur long before having conversations about the Savior. Nor is this book about all of the Christian facts we must know. If you want a book about discussion points you can use to win arguments or defeat your opponent’s point, you will be disappointed. It’s not a book about facts or a list of apologetic proofs that people need to know. If you want ammunition to defend your viewpoint, this book isn’t aimed at that aspect either. Rather, this book is aimed to help you use questions to examine assertions, claims, and world views, and use the questions to reveal weaknesses or faulty conclusions in those points. Koukl equips you with questions to ask, rather than a list of facts to recall. He focuses on skilled questions to help move a conversation along. Tactics equip you to help people talk themselves out of their beliefs through their own faulty logic. You don’t have to have immediate recall any apologetic arguments. These questions help you expose irrational beliefs that your conversational partner may have never examined. I want to draw them out, to invite them to talk more about what they think. This takes a lot of pressure off me, because when I ask a question, the ball is back in their court. It also protects me from jumping to conclusions and unwittingly distorting their meaning (Location 600). When the conversation becomes a monologue (yours), it’s time to let it go. (location 2938). I think this book would be accessible to: high schoolers and college students, young professional out in the work force, and anyone else that regularly has discussions with people who are opposed to Christianity but willing to talk with you. I think pastors could benefit from reading this book as well. I liked how the chapters built one upon another and the “What did we learn” summary at the end of each, just in case I wanted to quickly scan the contents of each chapter again. Get your copy of Tactics, Greg Koukl. From Amazon. This is an affiliate link and Amazon will kick me a few nickles. I bought my own version.